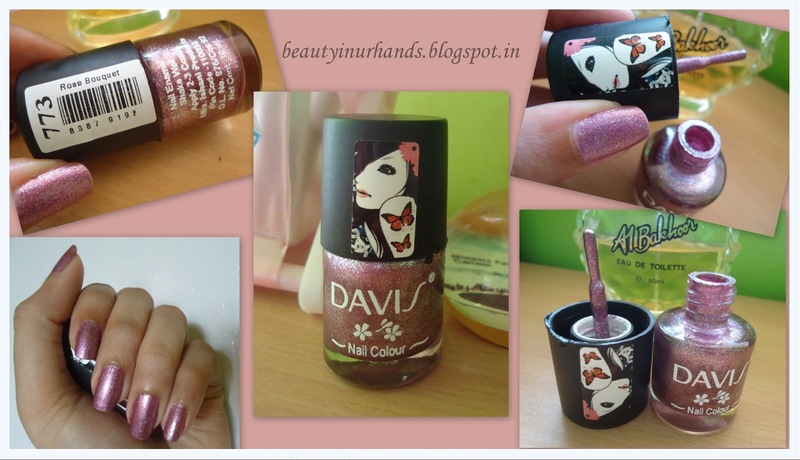 I'm currently wearing Davis Nail Colour in shade Rose Bouquet. At a price tag of just 35 INR this nail colour range is worth trying. This shade has plenty of shimmers. I also own another shade in this range, Rose Petal . The only con here is that it takes a long time for the colour to dry up, more than 15 minutes. Otherwise it is a lovely shade and perfect for night occasions. The nail paint lasts for more than two weeks without chipping if topped off with a transparent nail colour. I found this range only on Snapdeal.